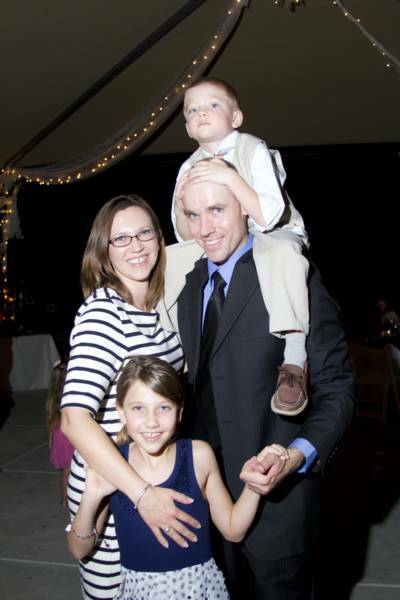 Epic Lights is a local Southern Arizona company. We proudly serve Arizona with the majority of our business coming from the population centers of greater Phoenix and greater Tucson. Our desire is to design the most beautiful 3-dimensional picture of your home and property. With our unique individualized sales process we promise you will not only love the process and final outcome, but you will love doing business with Epic Lights. We often take for granted the way our homes appear in the daylight, going about our routine business without so much as an afterthought to the view that is our constant companion. And once night falls, our homes become shrouded in a cloak of darkness that is pierced only by the occasional exterior light bulb or wall sconce. These lonely beacons of illumination have a utilitarian function, but what if we could enhance that utility and create something truly remarkable, something that we are proud to experience and enjoy? Outdoor lighting enables homeowners to beautify their homes and landscape while making the outdoor living space more usable and enjoyable into the evening hours. Well done lighting schemes transform the look and feel of your home at night into something more inviting and special. The added appeal creates depth and character to an otherwise forgettable experience. Start by taking an overall mental image of your property and envision what design elements you would like to highlight. Just as in a picture, we tend to focus most readily on points of interest along the lateral and vertical views. The magic occurs when we take advantage of real life depth that engages the viewer and pulls one into the overall experience of the light display. Soft and elegant lighting calls attention to specific points of interest like cactus or trees, and that is complemented by a balanced approach to the rest of the property so that the eye travels freely and effortlessly through the image while maintaining an overall sense of balance and perspective. Of course the home itself is the backdrop to the image and stucco affords a wonderful canvas upon which to paint spectacular shadows. Even the smallest and seemingly most obscure desert plant can be amplified to an impressive shadowy display across the vertical surfaces of a garage, low lying wall, or otherwise blank stucco surface. These larger than life images help us appreciate the unique architecture found in the highlighted plants. 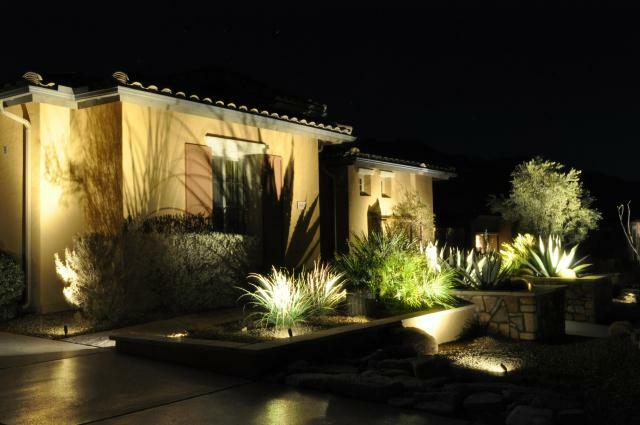 We often hear the concern about light pollution when it comes to landscape lighting. This is a valid topic as we are fortunate to live in a region where stargazing and the wonders of our wonderfully dark night skies abound. To appreciate the relative beauty and openness of the night sky, all one has to do is gaze toward downtown areas to witness the orange glow radiating forth. The goal is to discern no difference when viewing the sky overhead whether the lights are on or off. This objective is achievable and the results are stunning. Thankfully, with intelligent design and appropriate use of lighting technology, we can mitigate the immediate impact of landscape lights on the night sky over our homes as well as having no adverse impact on the overall macro night sky from afar. 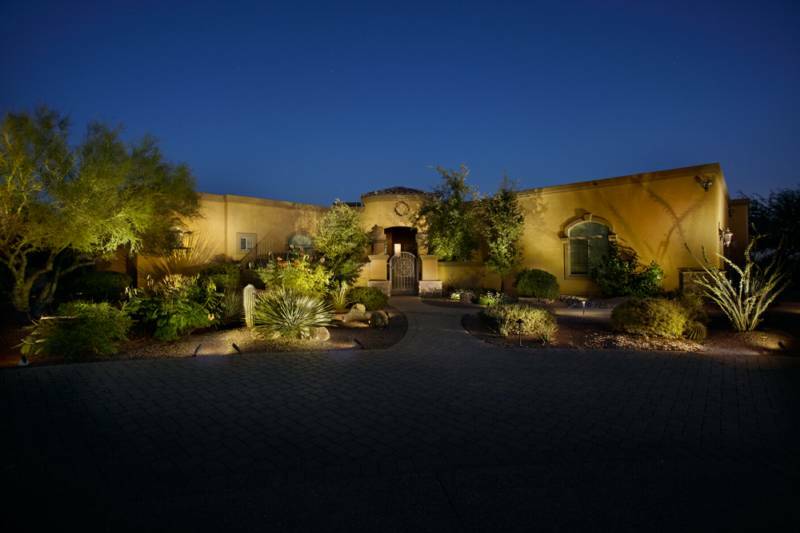 Technology used in landscape lighting has been truly revolutionary in recent years. LED (light emitting diode) lights have a long 15-year expected life, very low power consumption (~$1.07 per year electrical cost per light), cool to the touch, beautiful natural light output, don’t project off into the night sky, and don’t attract insects like traditional bulbs. LED light is a very well articulated illumination that shows the beautiful definition and detail of our natural desert fauna; for example, the individual spines of cacti are clearly visible and the colors of plant leaves and flowers reflect back in their natural brilliance. The difference between cool white and warm white is important. Cool white is a more stark and vivid appearance while warm white has the advantage of reflecting a “true to life” color back from your target of illumination. Of course like many things in life, a quality LED costs more, but the differences are immediately noticeable. Another consideration is the fixture itself; the concern here is what will stand the test of time while remaining functional and attractive. Brass is an ideal material in our environment as it resists heavy discoloration caused by the intense sunlight. All too often plastics, steel, aluminum, and copper alloys become off-colored and brittle after a few months of Arizona sun exposure. All materials will degrade over time, but well prepared bronze fixtures show their patina attractively as they age. The best brass fixtures are waterproof and designed to be visually unobtrusive and attractive during the day as well as standing up to the unrelenting sunlight and temperature extremes our climate has to offer. As one can tell, lighting and design have come a long way over the years. With proper design, materials, and a little artistic flair, you can bring your night imagination to light!